Last week, after attending an event with 125 law enforcement and private security professionals near the New York Stock Exchange, I began a walk uptown to enjoy some of the holiday decorations in New York City. Unfortunately, the American flags flying at half-staff throughout the city to honor the victims of our most recent mass shooting in San Bernardino, California, were a stark reminder of our culture of violence. The sight of so many American flags throughout the city, once again at half-staff, overshadowed the holiday decorations. It is a disturbing commentary on American life, when flags at half-staff seem to be the norm, rather than the exception. America’s culture of violence is continually manifested throughout our workplaces, schools, campuses, houses of worship, communities, and families. There appears to be no end in sight to the carnage. Dec. 2, 2015: At least 14 people died and 21 were injured during a holiday celebration for county employees in San Bernardino, Calif. It was the deadliest mass shooting in America in the past three years. Nov. 29: Three people are killed and nine wounded at a Planned Parenthood clinic in Colorado Springs, Colo.
Oct. 1: Nine people are killed, eight students and one teacher, and nine are injured at Umpqua Community College in Roseburg, Ore.
July 16: Two military centers in Chattanooga, Tenn., are attacked, leaving four Marines and a Navy sailor dead along with three wounded. June 18: A suspected white supremacist kills nine people at Emanuel African Methodist Episcopal Church in Charleston, S.C.
Sept. 26, 2013: A former Navy enlisted man shoots and kills 12 people and injures 3 at the Washington Navy Yard, Washington, D.C.
Dec. 14, 2012: A shooter kills 20 first graders, six and seven years of age, and six adults at Sandy Hook Elementary School in Newtown, Conn.
After each of these tragedies, the American flag was lowered to half-staff. America must stop the violent rampages and resolve with full-force leadership, vigilance, and collaboration to keep our flags flying at full-staff. A robust security program must be comprehensive, proactive, and continually updated. Security must never be piecemeal, negligent, or have its importance minimized. Security Vulnerability Assessments: These must be conducted by board-certified, reputable, and experienced public safety professionals in order to identify and evaluate areas of risk. Background Checks/Investigations: This is an essential due diligence countermeasure that prevent hiring individuals who do not deserve employment or access. These checks must be made by qualified, licensed professionals who honor laws conducting background checks. Background checks include criminal history reports, drug testing, motor vehicle driving records, credit checks, liens and judgments, sexual offender registries, employment and professional credential verifications. Investigations that include surveillance, interviewing, and information sources by experienced, conscientious, and ethical professionals are critical to protecting public and private enterprises. Training: A critical component of security and safety is ongoing training that includes personal safety, substance abuse awareness, domestic violence, diversity, conflict resolution, ethics, situational awareness, Internet security, workplace violence, fire prevention, crisis management, emergency preparedness, loss prevention, economic crime, crime prevention, drills, evacuations, and warning signs. Warning Signs: As detailed in my article titled “Warning Signs Are Critical to Violence Prevention” for the July 31 edition of Epoch Times, we must recognize warning signs and provide the necessary intervention, training, health care, and security measure necessary to prevent tragedies. Physical Security: This includes countermeasures preventing unauthorized access that includes fencing, barrier arms, card access systems, ID cards, lighting, crime prevention through environmental design, defense in depth, locks, alarms, fire extinguishers, Automated External Defibrillators (AEDs), mass communication systems, and metal detectors. Personnel Security: Certified, well-trained, and licensed security officer programs involving reputable contract or in-house professionals with either armed or unarmed personnel. Procedural Security: Drills deserve planning and evaluation with table-top exercises and involve partial and full-scale initiatives based on numerous possible scenarios. These must be complemented by the expertise and involvement of law enforcement and first-responders. Essential to training and drills is the Active Shooter program detailed on the FBI website titled RUN, HIDE, FIGHT. Informational/Cybersecurity: In this age of instantaneous global data at the fingertips of individuals across the globe, some with nefarious intentions, protecting information is vital to security. Informational security must be effective and continually updated with ongoing training for personnel that empowers them with preventive techniques. This protects companies from breaches of information through the Internet, dumpster diving, and social engineering and can prevent unnecessary turmoil to companies and employees. 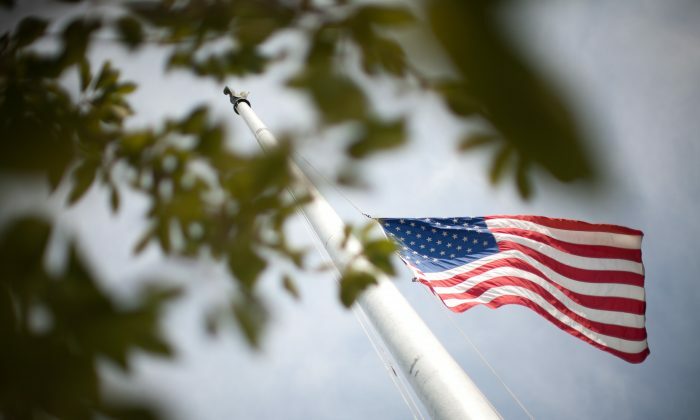 America must do everything in its power to prevent our flag from flying at half-staff to be the norm rather than the exception, due to violent rampages. Violence is preventable and we can safeguard our nation with sound security measures, training, and assessments, complemented by the principles of leadership, vigilance, and collaboration. Although a judge declared the killer mentally ill a year before the massacre, he was permitted to purchase guns from a federally licensed dealer. America’s mass shooter crisis continues with the most recent heart wrenching tragedy at Umpqua Community College in Roseburg, Oregon, on Oct. 1. The recent events in Paris demonstrate again that contemporary terrorism remains a global threat. America's cauldron of corruption and culture of violence threaten our national security and principles of democracy, freedom, and liberty.